Since Wednesday's post, I've had an idea in my head that wouldn't be shaken so yesterday I started work on a few little doodles which will be ready to share with you soon. There are various "pesky" jobs that I dislike when knitting and crocheting - winding skeins, sewing in ends, joining granny squares, finding dropped stitches - which got me wondering.... What are the little pesky jobs that you'd ask your own Little Yarn Fairy to take care of? I see you posted this 45 seconds ago, cool. 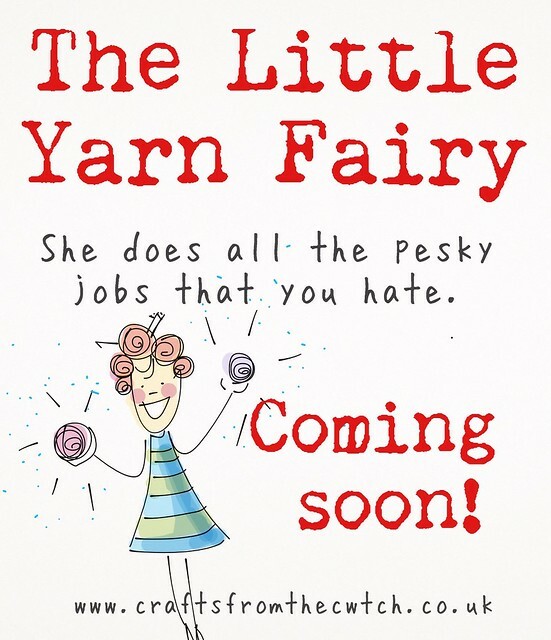 I would have a yarn fairy cast on and off, and if needed join in the round. I already have someone that helps untangle the mess my balls and skeins sometimes become so I would like a fairy to count the stitches in a cast on /chain row and to make sure that my stitches always "add up" to what they should be. I would like the Yarn Fairy to come and graft the ribbing on an arran cardigan that I am making longer! I've re-done it twice and still not right!! I love ball winding and act as a ball winding fairy for a friend! Sewing in ends! And the last half an inch of ribbing. Picking the next project!!! It's not that I don't like doing it but I take forever and a day to decide, so if someone could just tell me what to do next from my queue that would be awesome! Winding wool and weaving in ends are my betes noires. But I spent an afternoon on a sofa with a hapless aunt last Christmas, and ended up doing those two tasks for her... turns out it is much more pleasurable to help someone else with their ball winding and finishing - so I really think you're onto something with your yarn fairy idea! For me it's definitely counting stitches. A yarn fairy would have come in handy the other week when I was casting on 300+ stitches for a shawl! I love your doodles. I'd say swatching, weaving in ends, and yes, sometimes having to wind up the hanks. Casting on. that's the worst. I always wish someone would do it for me. Casting on and weaving in ends! Also, I would want her to come up with a use for the bits of yarn too short for my magic ball, because it feels a waste to throw them away! Winding up all the ravelly ends of wool but also making it easy to work out which end is the right end to start with when I want to knit. For a bead fairy I need one to sort out all the stray beads that need matched up with the rest of their strand. Weaving in ends for sure. Also the boring parts when you get to long stretches of stocking stitch.